Events in North Wales' premier seaside resort. 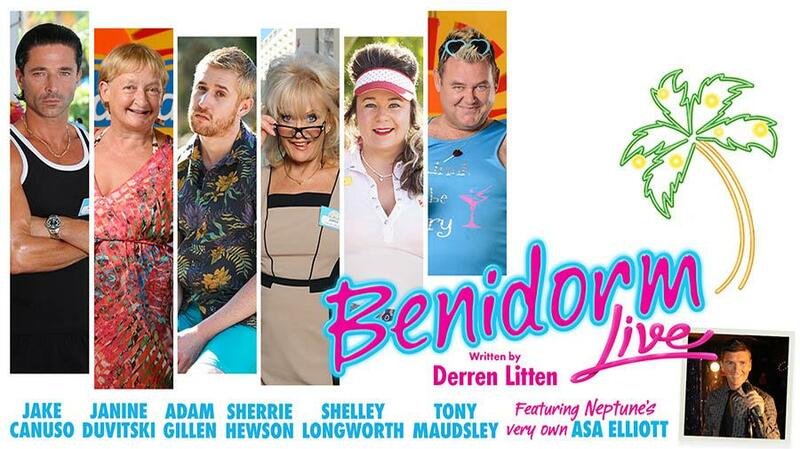 Starring Jake Canuso (Mateo), Janine Duvitski (Jacqueline), Adam Gillen (Liam), Sherrie Hewson (Joyce Temple-Savage), Shelley Longworth (Sam), Tony Maudsley (Kenneth) and featuring Neptune’s very own Asa Elliott, the official world premiere of Derren Litten’s smash-hit ITV comedy BENIDORM is set to bring sunshine and smiles to Llandudno in the stage debut production of the hugely popular TV show. ITV’s award-winning comedy celebrates over a decade of all-inclusive hilarity, having followed the ensemble cast of holiday makers and staff for ten series since it first broadcast in 2007. Litten has now written an all new set of Alicante escapades for the much-loved cast members as they swap sangria for the stage – after a quick spruce up at the Blow ‘n’ Go!